Artist Denise Hartley blogs about art, painting, murals, and philosophy. As an artist I seek balance in my life. As a healer, I use healing in my art process to address the healing of our planet. Birth of a Painting Series IV: "Blue Iris". Article by Denise Hartley, artist and gardener, etc. I have inherited my grandmother's love of flowers. Just moments after arriving for a visit, she would say, “Let’s go outside and see the garden". “Blue Iris” is a photo taken by my photographer son, Chris Gilbert, in that garden. His photo was the source of my painting. When we sold her home, the blue iris came home with me, recently planted in this tree stump. Flowers give me courage, the life of a flower is so ephemeral, the beauty of the flower quickly passes, and is soon replaced by another. My life is passing just as quickly, and I will soon be replaced by my children and grandchildren. I long to look at flowers (and grandchildren’s) beautiful faces. In my little greenhouse I have a tray of tiny lavender plants, also snow peas, and a flat of chamomile. The flowers attract the butterflies, bees, and birds. My desk looks out over my garden. My dad was the gardener, with a large vegetable garden, and a pergola filled with red grapes. I am the new keeper of his garden. My garden here, although established, was a working man’s garden. I just finished planting his vegetable garden this winter, and I planted a peach tree, expecting blossoms and delicious peaches late spring. I am off to paint a ceiling mural, sky and clouds, on my future grandchild’s nursery! Many thanks for visiting this site! Please respect the artist's copyright! Birth of a Painting Series III: Blocked. As an artist, I paint when I am inspired. Everything flows; feeling great, working in the studio for hours, paints flow from my brush. 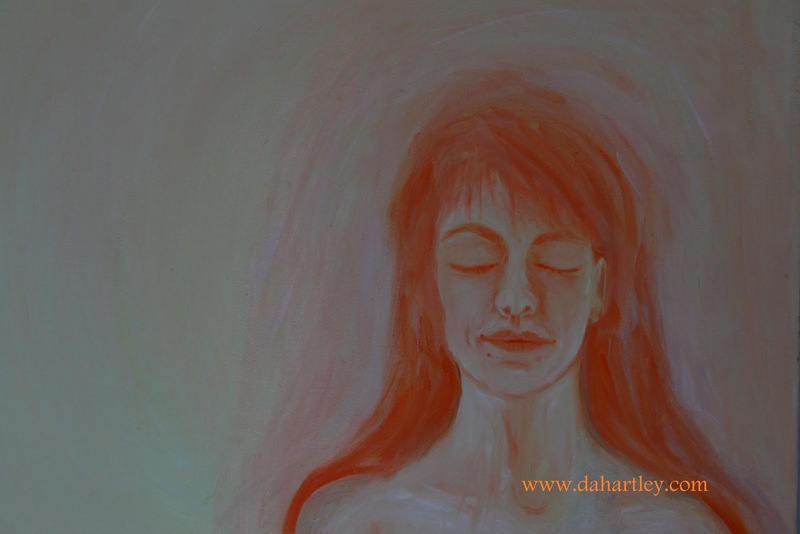 The question is how to be an artist when the inspiration has disappeared, when you feel blocked from your inner self? I began this series of paintings while I was blocked! My creative solution was to paint the limitation that I was feeling. I began just to paint actual BLOCKS, placed in restrictive grids, which eventually swirled into patterns. The first painting this series is the painting “Eye of God”. Using the contrasting shades of blue and orange created a boldness I had not expected. Somehow the ‘eye’ is not blocked, or it is not placed within the grid. The ‘eye’ expands to me the feeling of what is possible, or what is enduring within myself. using analogous colors. The lovely landscape is blocked by a large grid, and it is broken into drip-like smaller grids within the panes of a window. To me that exemplifies that there is beauty in the world, yet at the time I could not quite access it. greens. But everything in the painting is off kilter, the edges are leaning at odd angles. 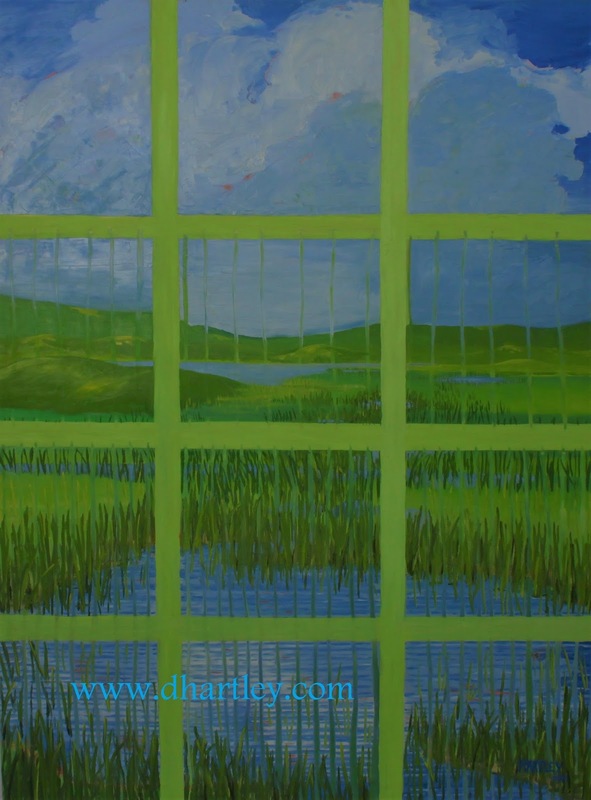 The blocks and the grids remain in the painting. The artist is still blocked, but she is stacking the blocks in a manner that creates tension in the artwork. The dominant orange, the contrasting blue highlights, black drips, blobs, and pools, and yes, the first block began in this painting, on the upper mid-right of the canvas. "She Broke", oil on canvas, 30"x 48", 1998. I have created another video in the “Birth of a Painting Series”: BLOCKED. This is the second painting in the series: Birth of a Painting Series. Artists love to create, and I am trying to dedicate my time to create a platform to showcase my art. Sadly, painting is so much more rewarding for me! This week I am washing each of my paintings, photographing them, and formatting the photos for different uses. Before this, then that, which means that I have to learn to use a 35mm camera, light balance, f stops, the list is endless. I was almost caught swearing the other day. My son is helping me with #'s. I have started posting on Instagram:dahartley222, Twitter: DAHartley, my wordpress blog, Friend Nature (https://friendnature.wordpress.com). The learning curve makes my head spin. I would rather be out today under the blue sky digging in my garden! My art focuses on spirituality, healing, self-expression, and nature themes. My collectors have noticed my healing theme, my paintings have been purchased by hospitals, nurses, and healing professionals, and those individuals that need healing. I am currently inspired by artist, writer, and teacher, Lisa Congdon. Her book, ART, INC. is driving me on. (lisacongdon.com). She offers ideas on how to prepare a press kit, advertising on line, creating a marketing plan, just about everything you need to learn to promote your own art. Check out her website! 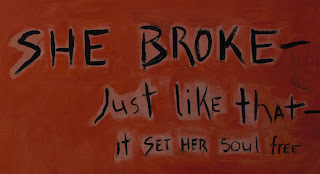 She Broke, is the first of a similar group of paintings from my BLOCKED art show in 2000. I will be posting the rest of the painting in the next several posts. Well, back to work (where are the emoji's on Blogger?). The painting, “She Broke” is dedicated to the “MeToo” movement and to all women. Time Magazine’s Person of the Year is dedicated to #MeToo. 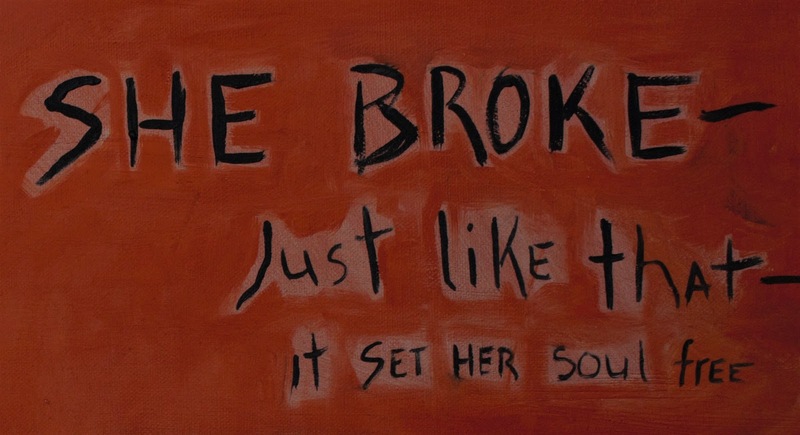 She Broke, oil on canvas, 16" x 20", 1998. Self Portrait, oil on canvas, 16" x 20", 1998. 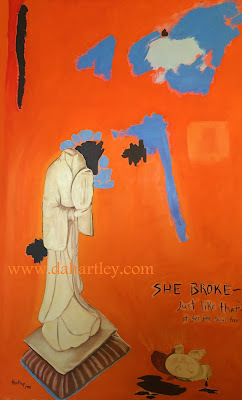 A thirty second video from: Birth of a Painting Series: She Broke. In the Birth of a Painting Series, I try to give examples where the artist finds inspiration in creating an artwork, and how the creative process develops within the artist. I begin this series with my painting “Blossom Peak”. It is a 4’ x 6’, mixed media painting on a wood panel, created in 2004. It is in a private collection. The inspiration for the painting “Blossom Peak” began on a hike I took with my son. We climbed an iconic peak in Three Rivers, California. Three Rivers is near the entrance to Sequoia National Park, on the banks of the whitewater Kaweah River. The park is the home of Mount Whitney, in the Sierra Nevada mountain range. It is famous for its giant sequoia groves, jagged peaks, and glacier polished valleys, rushing rivers, and wildlife. As a resident of Three Rivers, hiking is an important experience, as well as white water rafting and swimming, and it is the backpackers dream location. My young son I enthusiastically began our hike at the base of Blossom Peak, and headed straight up hill, we rose above California’s Central Valley, hidden by fog. After reaching the top, we could see the peaks of the Sierra Nevada, signed the book, made our cell calls, and then my son looked over the steep edge, and slipped. He somehow caught himself at the last moment at the precipice, a 35’ drop to the rocks below. In the spirit of jubilant thankfulness, we began our descent. The inspiration of this painting was based upon the high emotions that I felt that day, and on our return, I began this painting, “Blossom Peak”. Video: Birth of a Painting Series: “Blossom Peak”. 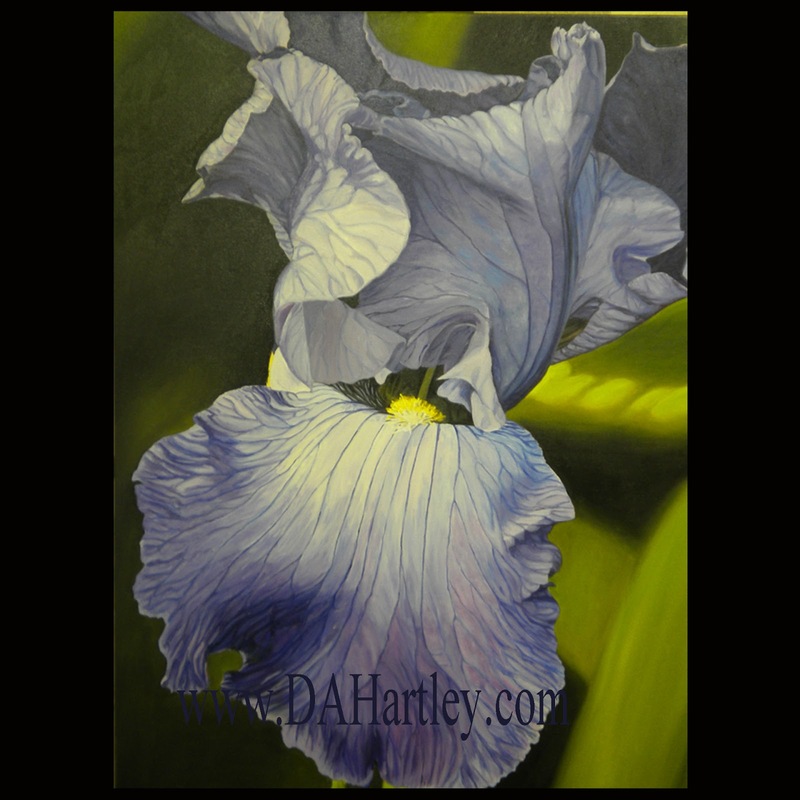 Denise Hartley was born in Oakdale, CA; lived in the art community of Three Rivers, CA for 22 years, studied art in NYC at the Art Students League, and lived on the island of Kauai, in Santa Barbara, and currently lives in Oakdale, CA. MA degree in Fine Art, New Media. My life has been driven by art. The artist eye looks to nature for inspiration, and then artist within translates these insights into an art work. Anything may appear onto the paper or canvas. The artist may channel the past, the present, or the future. I am a Reiki healer, and use healing in my art process. As a artist and healer, I address the healing of our planet. I try to approach Climate Change, and our damaged environment, more as a spiritual issue. First we have to heal ourselves, and by doing so we will become aware of the reality of the global stress that humanity has caused. I studied at the Art Students League, NYC, with professional artists of New York. I have a BA degree in Art, yet found my voice with my BA in Philosophy, and a Masters Degree in Fine Art. My business has been painting murals. My favorite project I painted with my son, the children’s floor, Children’s Hospital, Central Valley. (www.dahartley.com). I have a California teaching credential in Art, longing to share my experiences as a professional artist. I have lived in the mountains of the Sierra’s in California, and at the sea in Monterey, and Santa Barbara. In New York City when I was young, and a few years ago, on the island of Kauai, teaching children with autism. I currently live in Oakdale, CA. College of the Sequoia's,Visalia, CA. to create a hospital floor of murals for the Children’s Hospital, Central Valley. She studied at the Art Students League in NYC. 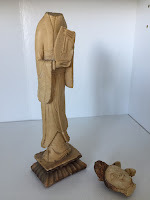 Denise Hartley had two BA degrees, in Fine Art and in Philosophy (Religion). Her MA is in Fine Art, New Media. 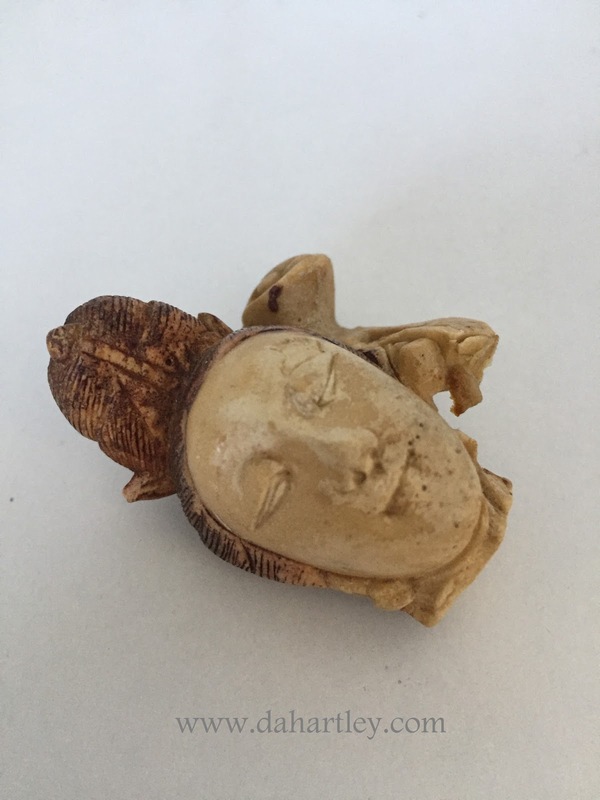 She received training from the Victoria and Albert Museum, London, in sculptural restoration. and worked for the conservator of the Whitney Museum, NYC. to children of migrant workers. She has received a diploma as a producer from the Hollywood Film School. as Art Director of the Academy Awards, at the American Music Awards (2003). Corporate purchases include four painting for Kaweah Delta Hospital, and the Sequoia Regional Cancer Center in Visalia, CA. Radio Interview, March 2003, one hour interview with Janet Flores, Wisdom and Compassion Show, KFCF (KPFA), Fresno CA. Visalia Times Delta, February 26, 2004, Family’s Support is Artist’s Greatest Joy. Fresno Bee, October 22, 2004, Sierra View Handles New Wing with Kid Gloves. Lifestyles Magazine, July 2005, Denise Hartley, text by Carol Firstman. Artist Denise Hartley moves to Santa Barbara (right) having lunch with daughter Diana. Imagine 50 origami kimonos, using patterned and textured papers, assembled into one project, with a female figure drawn wearing a kimono. This AP student created this multi-media project, one in a series of world-wide women’s traditional costume and dress. Birth of a Painting Series V, "Golden Falls". ALL D.A. HARTLEY (Denise Hartley) IMAGES Copyrighted 2019. Awesome Inc. theme. Powered by Blogger.